Tune in this evening, May 10, 2017, for a formal YouTube Debate on the Salvation of Israel– Romans 11:25-27! Formal Debate on YouTube / FaceBook! The video of the entire formal YouTube debate held May 10, 2017, between Dr. Himie Pickett, Progressive Dispensationlist, and Dr. Don K. Preston (true preterist). Dr. Preston has had numerous formal debates on eschatology. The topic of this formal debate of 90 minutes, livestream YouTube debate, centered on the “salvation of Israel” as promised in Romans 11:25-27. Dr. Pickett affirmed that national, ethnic Israel will be converted at the Second Coming of Christ out of heaven, at the very height of the Great Tribulation period, some seven years after the Rapture has removed the church from the earth. Dr. Preston will affirmed that the salvation of “all Israel” as promised in Romans 11 was fulfilled no later than the fall of Jerusalem in AD 70. You may watch the debate in its entirety on YouTube, It will also be archived on www.fulfilledradio.com. 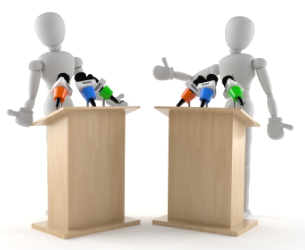 Be sure to watch this formal debate on an important topic!